Sackett-Waconia began designing & manufacturing bucket elevators in the 1920’s. Since their inception, the key to success has been simple, tough, designs that are purpose built for environments they serve. That quality is still alive today, but modern elevators are easier to maintain and operate, with safety as a standard feature. 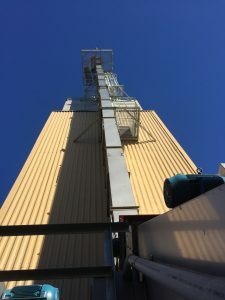 Sackett-Waconia bucket elevators are designed for high volume industrial applications, and engineered for the intended duty and environment. 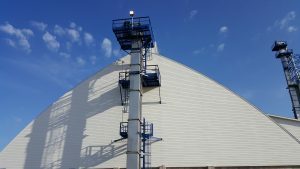 They handle materials from powder to granular, and can be found in process plants, fertilizer terminals, blending plants, and anywhere bulk materials are handled. Capacities range from 50tph to well over 1000tph. We design and manufacture an extensive line of elevators, including belt and chain, centrifugal and continuous discharge, with bucket styles including CCHD, AA, AC, D, DH and super capacity. Our elevators typically feature nylon buckets, but can come with a range of materials such as polyethylene, urethane, or steel. Sackett-Waconia’s standard line of elevators feature heavy 304 stainless steel construction, properly sized pulleys, split bonnets, and Dodge drive components. Our elevators are designed for easy maintenance access with doors at key points and easy to reach grease fittings. Boots feature heavy plate construction with easy access clean-outs and stainless steel take ups. 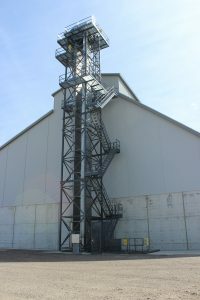 Sackett-Waconia bucket elevators are vertically self-supporting and their simple design is meant for a long service life in any environment.